The UK Ministry of Defence today announced signature of a $1.98bn deal to purchase five E-7 airborne early warning and control (AEW&C) aircraft to replace the RAF’s fleet of E-3D Sentry AEW1s. The aircraft will be similar to the E-7A Wedgetail operated by the Royal Australian Air Force (RAAF). 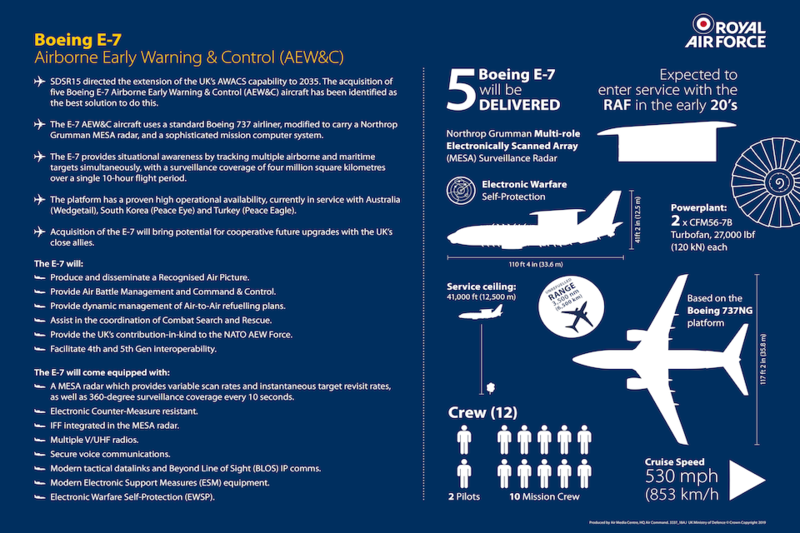 The E-7 is based on a standard Boeing 737 NG airliner modified to carry a Northrop Grumman active electronically scanned array (AESA) radar that can cover four million square kilometres over a ten-hour period. Modification of the aircraft will be carried out in the UK at Marshall Aerospace and Defence Group in Cambridge. ‹ ‘Dark Knights’ – a new F-117 squadron?